The largest amphibious landing in military history involving United States, British, Canadian, Polish, and Free French forces. This operation helped pave the way for ending Hitler's thousand year Reich 988 years early. 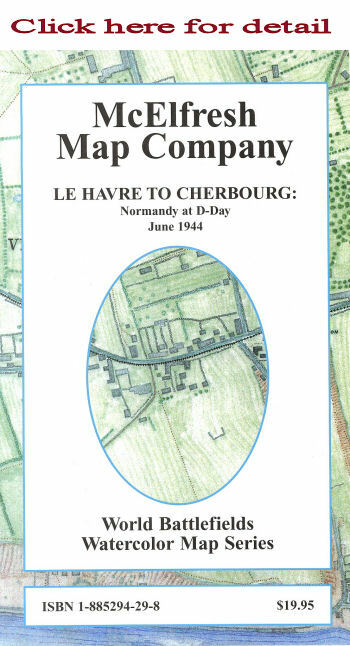 Map Image: 45" x 23"
Overall size: 48" x 26"
Description: The principal map encompasses the entire D-Day area, from Cherbourg to the Bay of Seine, and deep into Normandy to show Coutances, St. Lo, Caen and Lisieux. The reverse side features a description of the American Engineer Model Making Detachment and the British V-Section and includes rare photographs of their three dimensional map models. Copyright 1999-2016 McElfresh Map Co., LLC. All rights reserved.